Featuring Shashmaqam (Bukharan Jewish music and and Central Asian dance), João Cirilo Pilom Batuko Band (Batuko and Funaná from Cape Verde), Shilpa Ray (Indie rock with the harmonium), Canzoniere Grecanico Salentino (Pizzica tarantata from Puglia, Italy), and Rimel (Norteño music from Mexico). Shashmaqam is a vibrantly colorful ensemble from Queens, NY that performs the highly compelling and centuries-old musical traditions of Central Asia. As the United States’ premier ensemble dedicated to Central Asia’s Bukharan Jewish music and dance traditions, Shashmaqam performs a panorama of classical and folk music from Uzbekistan and Tajikistan. Simultaneously, they perform the liturgical repertoire of Bukharan Jews which instrumentation includes the tar (lute), doire (frame drum) and accordion. Shashmaqam, which takes its name from the ancient repertoire they perform, was founded through musical evenings dancer Firuza Yagudeava hosted at her former restaurant in Manhattan in the late 1970s. Since then, they have performed on stages across the US and have recorded for Smithsonian Folkways Records. Hailing from a long legacy of musicians, João Cirilo Monteiro has become an ambassador of Cape Verdean music abroad, having brought the highest quality of Funaná, Batuko, and Coladeira traditions to the United States. Monteiro was born in Cape Verde and came to the US in 1982. Monteiro has several recordings to his name, including Pilom Batuko (2010). His “Po D’Terra” was featured on Space Echo: The Mystery Behind the Cosmic Sound of Cabo Verde Finally Revealed compilation in 2016 (Analog Africa.). After Cape Verde was colonized by Portugal in the 15th century, the islands were used as holding centers for captured Africans who were later shipped to North and South America as slaves. The mix of European, African, Brazilian, and Caribbean cultures created new forms of music. Morna, similar to Portuguese fado, is the slow, bluesy music made famous by the late Cesaria Evora. The faster and more upbeat Coladeira accompanies couple dances. Batuku and Funaná were initially banned by Portuguese colonial authorities because it was African and slaves played and danced it in private. Originally a woman’s folk music, Batuku is traditionally performed by a group who beats sacks of flour held between their knees while a lead singer improvises verses. Funaná is perhaps the most upbeat Cape Verdean music, an accordion-based genre from Santiago. The rhythm is usually provided by the ferrinho much like the use of washboards in zydeco and the güiro in Latin music. Nobody grows up wanting to be an artist’s artist. Appreciated by the sub sect of the sub sect is like being the beauty queen at the leper colony. Anybody who claims they grew up wanting to even be an artist rather than an astronaut or a Cthulhu is probably lying or was a corny kid. Your friends will find you irritating and your parents will certainly not throw you a parade. Shilpa Ray is, through no fault of her own, one of our unsung great artists. Having made her bones with the gothic Sturm und Drang of Beat The Devil and moving forward to the blues erosion of … and The Happy Hookers, Shilpa Ray has been, armed only with an incomparable voice and harmonium haunted by the ghosts of dead lovers, perpetually crying in the wind, hoisting both middle fingers in the general direction of god. It’s not a life a wise man would choose. But, again, what can you do? Formed by writer Rina Durante in 1975, Canzoniere Grecanico Salentino is regarded as Italy’s leading and longest-standing traditional music ensemble, hailing from the Salento, the heel of the Italian boot, in Puglia. CGS is a dichotomy of tradition and modernity together; the seven-piece band and dancer are the leading exponents in a new wave of young performers re-inventing Southern Italy’s Pizzica musical and dance traditions. The ancient ritual of pizzica tarantata is said to cure the taranta spider’s bite and the resulting altered state of consciousness, with its frenzied trance dances. Fueled by the tamburello (a frame drum which resounds like a never-stopping beating heart), CGS shows are explosive: full of energy, passion, rhythm and mystery. They bring the audience from the past into modernity, and back. Critically acclaimed with 18 albums and countless live performances throughout USA, Canada, Europe and the Middle East, in 2010 CGS was awarded Best Italian World Music Group at Italy’s MEI confab. They have also performed at globalFEST, SXSW, and Festival international de Jazz de Montréal. Rimel is a regional Mexican band formed by sisters: Letty (vocals and bajo quinto), Shely (accordion), Tita (vocals and bass) and Melen (drums). 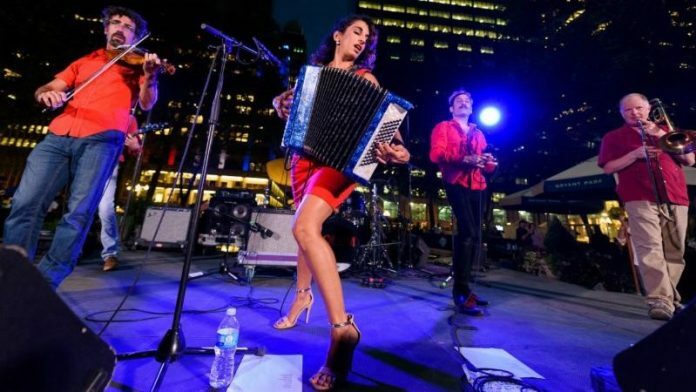 Rimel’s goal is to create a stronger presence and awareness of women in Norteño (also known as regional Mexican) and to expose this style of music that has traditionally been played only in the Latino community —- all over the world.